Projections are a very powerful tool when putting together fantasy draft boards. They are all over the internet and readily available. Trust me when I say that none are as detailed and informative as those in the PFF 2018 Fantasy Playbook draft guide. This guide dives deep with such information as average depth of throws, target shares, and points per touch. While perusing this bevy of information, I came across a few projections that might come as a surprise. Let’s take a look at some of those projections at each offensive skill position that caught my eye. To say the Lions running game has struggled over the past few seasons would be a vast understatement. Detroit has finished dead last in the running game twice in that time and as the 30th-ranked team in the other season. That has led to Stafford averaging 583 attempts per season over that time. Under GM Bob Quinn, the Lions have made numerous moves to upgrade the running game, including signing free agent offensive linemen T.J. Lang and Rick Wagner prior to the 2017 season. They went on to select offensive lineman Frank Ragnow with their first pick in this year’s draft. Detroit also addressed the running back position by signing free agent LeGarrette Blount and moving up in the second round of this year’s draft to select Kerryon Johnson. The writing is on the wall that the Lions are committed to establish a running game and lessen the amount of times that Stafford has to throw the ball. 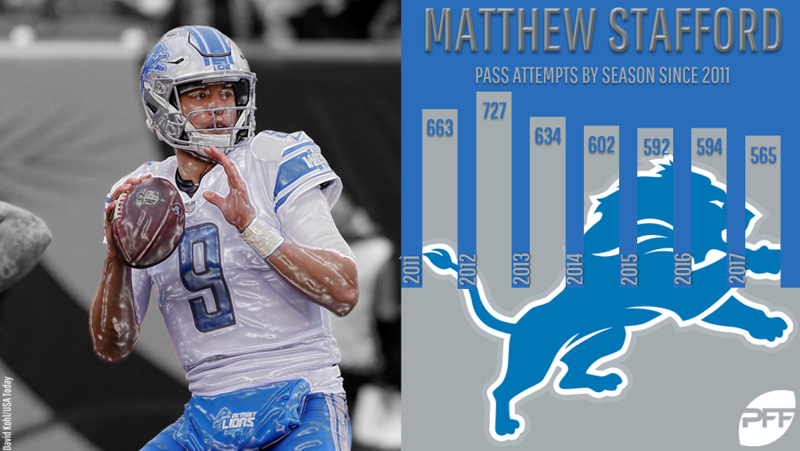 A quick look reveals that the strategy was already in place last season, as Stafford attempted 565 passes, which was 29 fewer than in the 2016 season. I’m not sure I buy 583 attempts for 2018, but if you believe the projections, the ball will still be there for Golden Tate and Marvin Jones. There’s no doubting that Hunt was one of the more pleasant surprises of the 2017 season finishing, with top-five fantasy running back totals. However, let’s not forget that Spencer Ware was in line to be the lead back for the Chiefs before tearing his ACL and PCL thrusting Hunt into a starting role. Let’s also keep in mind that there was a seven-week stretch last season in which Hunt failed to reach 100 yards rushing in a game and finished 24th or worst in fantasy scoring five times. Despite catching 53 passes as a rookie Hunt struggled in pass protection and the Chiefs have taken measures to address that situation. Kansas City has signed running backs Kerwynn and Damien Williams and both could prove to be third-down options. The duo had a combined 30 receptions last season and 166 carries for their respective 2017 teams (Arizona and Miami). While it is unclear as of this writing if Ware will be ready for training camp there will no doubt be a role for the former starter once he does return. In 2016, Ware put up 1,369 total yards and scored five touchdowns finishing as a solid RB2. The Fantasy Playbook projects Hunt for 232 carries (40 fewer than last year) and 54 receptions. If that’s the case, it seems likely Hunt will hold off all challengers for any more than a small part of his workload. A carry total of 204 would more or less mean that Drake will emerge from training camp as the Dolphns’ clear-cut No. 1 running back. Yes, he did step up admirably after the Dolphins traded their starting running back Jay Ajayi to the Eagles midway through the 2017 season. Drake actually put top-10 fantasy totals Weeks 8-17, with 873 yards from scrimmage and four touchdowns over that time. There are a few factors that worry me when we see a projection of 71 more carries this season than the 133 that Drake had in 2017. The first is that the Dolphins ran the ball least of any team last year, with just a total of 360 carries. It took until Week 13 for Drake to hit double-digit carries in a game — he had just four carries while Ajayi was with the Dolphins. The fact that Miami chose to sign veteran Frank Gore could also give pause. No, Gore isn’t what he used to be by any stretch of the imagination, but he is coming off a season in which he had 261 carries. In fact, Gore has had at least 250 carries in seven consecutive seasons. The arrival of Gore and drafting of Kalen Ballage could be a worry for those hoping to rely on Drake. That’s why this projection — 204 carries would have been a top-20 total in 2017 — should give heart to fantasy owners. A Kenyan Drake who tops 200 carries is a solid fantasy running back. Engram had a very successful season as a rookie from a fantasy perspective, putting up top 10 totals with 64 receptions for 722 yards and six touchdowns. A quick look back reveals that it was the first time a rookie tight end finished in the top-12 in PPR scoring since Rob Gronkowski back in 2010. Engram managed to accomplish those gaudy numbers by being targeted a hefty 115 times in his rookie campaign. It’s the reason he saw so many targets that could raise some worries headed into the 2018 season. The Giants wide receiving corps was devastated by injuries last season as Odell Beckham Jr., Sterling Shepard, and Brandon Marshall missed a combined 28 games. The target total for Engram may have been more out of necessity than than the team actually wanting to target the rookie so much. In fact, the 115-target total is the first time a Giants tight end had seen more than 100 in a season since Jeremy Shockey back in 2006. With Beckham back and Shepard healthy, not to mention Saquon Barkley catching passes out of the backfield, it could make sense that Engram will see his target total drop. And if his target total drops, Engram’s fantasy stock would drop as well. That’s why this projection of 119 targets is so important. Even if you don’t believe in Engram’s talent as an elite tight end, that’d be at or near the top of the tight end target list, and targets are the key to production. A 119-target Engram is a fantasy success. Gordon getting 135 targets could be seen as a surprise, considering the lone 100-plus target season of his career was back in 2013, and he’s played 10 total games in four seasons since. Add to that the arrivals of Jarvis Landry, Nick Chubb, and Carlos Hyde in Cleveland to go along with Gordon, Duke Johnson Jr., and David Njoku, and there are a lot of mouths to feed. Add to that the fact that Tyrod Taylor has never had a single pass-catcher top 96 targets, and Gordon could be seen as a longshot to get to 135. The flip side is that that might seem like a low yards-per-reception average, as Gordon has bested 15.8 YPR in three of his four active seasons, and sits at 17.3 for his career. Ultimately, this projection says that Gordon could hold his value even in PPR leagues — 135 targets would have been a top-10 total in 2017. Only one receiver with at least 135 targets had a higher YPR average than Gordon’s projection last year (Julio Jones), so that can help explain why that number might be low — it’s just harder to keep the average high as the denominator grows. Even with the slightly depressed YPR, this projection shows that Gordon will carry significant fantasy value.